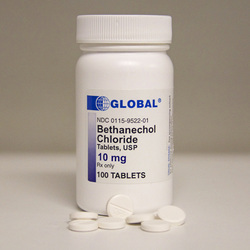 Bethanechol is useful in treating bladder atony which occur in post operative period or post partum. Bethanechol will acts on the muscarinic receptors mostly muscarinic 2 ( M2) or muscarinic 3 ( M3) receptors. Bethanechol will not react with muscarinic 1 receptor (M1) on the central nervous system due to bethanechol inability to cross the blood brain barrier. Bethanechol will stimulates the M3 receptors which cause an increase in contraction of the bladder with relaxation of the sphincter of the bladder. This will leads to urination. The side effects of bethanechol may include diarrhea, salivation and sweating due to activation of the M3 receptor while bradycardia due to activation of the M2 receptor.